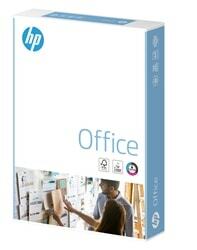 HP A4 80gsm paper - High performance, everyday office paper for high volume printing and copying. Ideal for copies, drafts, faxes, e-mail attachments, meeting notes. Compatible with all laser printers, copiers and fax machines. Keeps your office equipment clean and healthy by removing microscopic dust particles that can cause wear to fusers and rollers. With a jam free rate more than four times better than the industry standard of one in 10,000, tests revealed that hp everyday papers can help reduce your printer and copier down time by up to 85%. Separate tests showed that serious jams leading to service callouts can be cut down by a quarter. *Now with Colorlok™ technology that "locks" colour into paper producing documents with improved contrast, sharper images and faster dry times. HP Office is produced using FSC accredited pulp from well-managed forests independently certified according to the rules of the Forest Stewardship Council. ECF. ISO9706. Nordic swan. ISO14001.